After my dad retired, he got into antiques. Knowing my love for type, design and printing, he's always on the look out for something unique. Over the years, he's found a bunch of great wood and metal type, type drawers and other printing materials. A 100-year-old litho stone. The logo for Carlisle and Co., a San Francisco printer. Note the name of the company in the feathers. Before Christmas, he sent me an email that he had purchased my Christmas present, but wasn't sure exactly what it was. 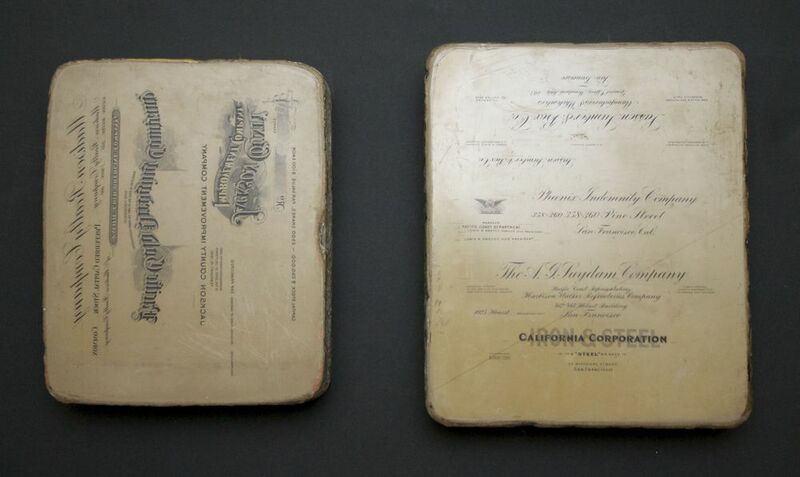 The auction listed the lot as "printing stones" and no one really knew anything about them. He had one for me, but to get it, he had to buy the entire lot. 11 stones in all. Each block is limestone and about 10 x 12 inches and about 2.5 inches deep. They weigh around 30 lbs. each. They are marked on the side with a red identification number. 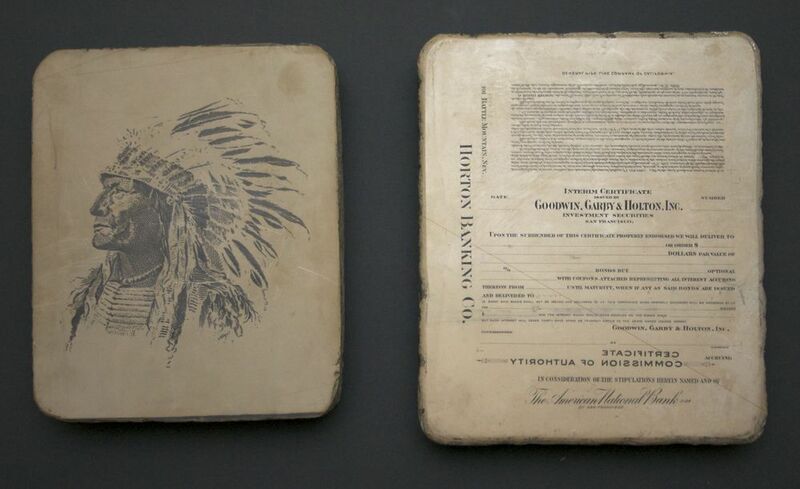 My Christmas present had a large Native American illustration on one side and stock certificates on the other side. I didn't see it at first, but the feathers of the head dress spell the name "Carlisle and Co." A quick Google search and I was able to find A. Carlisle and Co., a printer still in operation and currently located in Reno. Thanks to a corporate history published on their 100th anniversary in 1953, I was able to find out a lot about the company, the Indian and the stones. 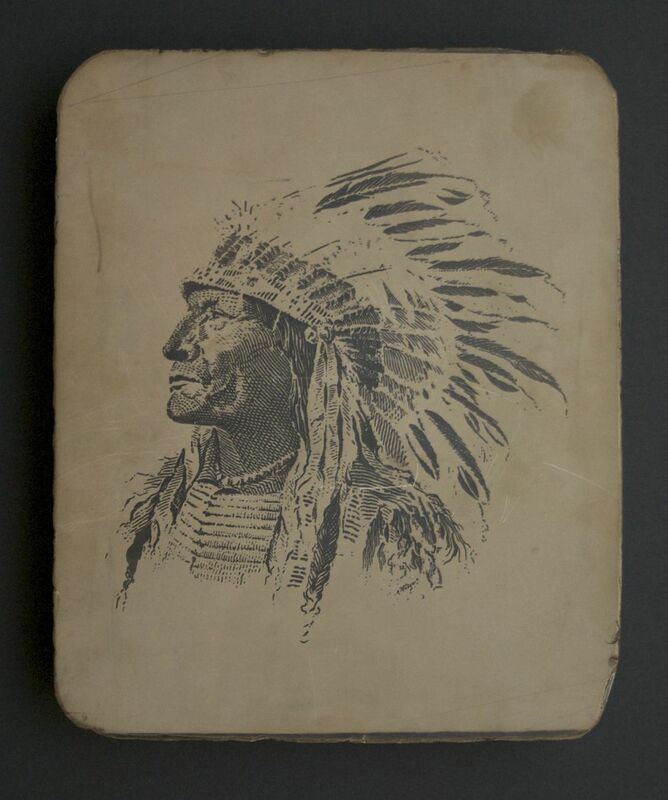 The "Carlisle Indian" was drawn by the wife of the founder, Eleanor Majors. Interestingly, her father was one of the co-founders of the Pony Express. Carlisle (and several companies that they acquired over the years) were located in San Francisco for over 100 years. Carlisle was a top producer of government and corporate printed materials. Most of the stones are letterhead and stock certificates. Some of the stones are in Chinese. The company building was destroyed in the Fire of 1906, but the company found a new location afterwards. Carlisle purchased lithographers Britton and Rey in 1917. Based on the dates on these stones, they look like the art is from the early 1920s. Some of the stock certificates are dated from even earlier. Several different designs are on each stone. Both sides of the stone are used. I have no idea how these stones made it from San Francisco to an auction in South Carolina. I'm assuming at some point they were given to an employee who then moved east. The "Carlisle Indian" is actually on the A. Carlisle and Company web site today. The corporate history, A. Carlisle and Company: The First Hundred Years is an amazing look at the history of printing, detailing the process with lots of photos of old equipment. It's been scanned and made available through the University of California. If you are interested in printing or design, check it out. I'm going to try to research the other stones. I've actually only seen 2 of the 11 stones. They are an interesting snapshot of the growth of industry in California at the turn of the century. I'll post pictures and background on them here as soon as I can catalog them all.